American Apparel skirt. COS blouse. Rebecca Minkoff bag. Michael Kors watch. Pucci sunnies. Jessica Simpson platforms . Love how your skirt reflects a metallic effect! Love the bag too! You look absolutely sweet & stunning! LOVE <3 you are so gorgeous! 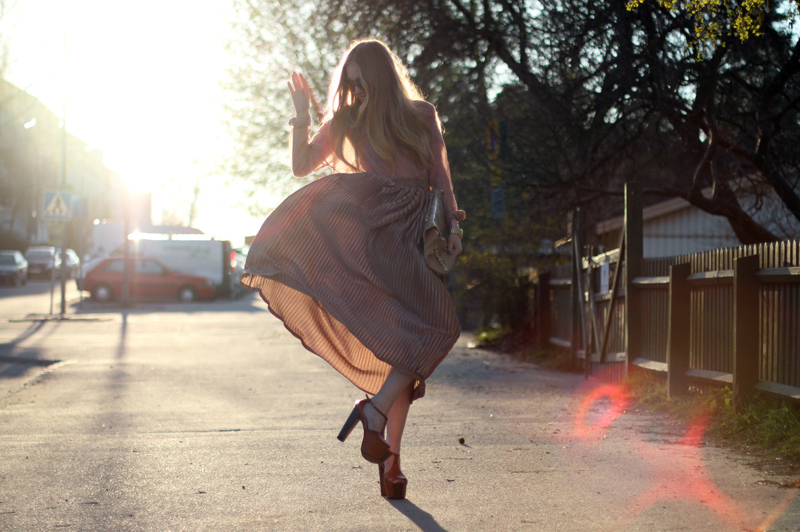 Gorgeous photos – the skirt looks lovely in the sunlight! wauw you are so stunning, beautiful photo’s dear! beautiful pictures! love the whole atmosphere! Love this outfit, you look GORGEOUS! I can’t pick what I love more, it’s all perfect! And those shoes and that bag have to be the awesomest things I’ve ever seen! The light in these pictures is amazing. Love the skirt and the bag so much. Gorgeous outfit. I love your sunnies! Make the most of the nice weather whilst you can, especially if it’s dark 50% of the time. Enjoy your day. this look is pure lust. lovelovelove the details like watch with the purse. These shots = PERFECTION. Love the AA skirt and the colors of everything. I basically need this outfit in my closet immediately! hahaha! Sejt outfit! Virkelig fin takse og nederdel. That skirt and bag is ridiculous gorgeous hell, the whole outfit is amazingly put together. Beautiful! This outfit is beyond amazing! I love it. Especiallt the AA skirt, I’m want it so bad! Love the bag too. Gorgeous skirt- love how you’ve styled it. So beautiful! This skirt is to DIE for!!! The skirt and the heels are so lovely! loving this pale colors and the skirt so much! You look so pretty!! That skirt and that bag, you know how to dress lady! and I’m falling in love with the JS Dany’s all over again ..
wow, that first pic is breathtaking! so beautiful! love this outfit on so many levels. the pleats on both the skirt and the purse. the metallics in both as well, the nudes, those sunnies, those shoes, head to toe: it’s perfect! Your skirt and shoes, oh my, I’m in love! amazing! i lve eveyrthing about this outfit! You look amazing. You shine out of the picture. Not only because of the smile, but especially because of the styling, and colours. finally revealed!! still obsessed with this bag. it’s kind of fabulous. You look like a goddess! Such a beautiful color palette, and that AA skirt is divine. love your bag & heels! You look stunning. The colors are so perfect together and the items on itself so good… you are an amazing inspiration, always! amazing hippie look. i love love love your skirt, and offcourse the platform heels! I really love the movement of your skirt! The photos are lovely. and your blouse, sunnies and skirt are great! amazing!!!! love this outfit and the pictures..
Love your outfit! great pictures!love how you combine the colours! Spring and summer in Stockholm is unbelievable! I know what you mean about enjoying the sunlight when you have just been through a Swedish fall/winter. Great outfit! Super Styling! Seriously one of your best outfits!! loving this look.. so effortless chic! Great Look & nice Photos! I love sunny days! They do a pretty amazing! Your look is adorable. I loved her skirt! And your bag is perfect. I am in LOVE with that bag! Wow. fabulous killer shoes. I love the color too! What do you think of the video I posted in my blog? You look gorgeous! Amazing skirt. love the colours! this outfit is amazing! I have been looking forward to this post since yesterday evening when you posted that detail shot of your bag + watch, and you surprised me again! I expected something good, but this is just perfect! Lovely outfit, the skirt is a beautiful colour and fabric. The photos look like your shoes are red, but I still love them in their real colour! lovely look! the shirt and skirt look great together! Love this Peach Old rose color Clothing! do my blog as well, iÂ´m very new so try my best! Have a look! I really LOVE that bag and those shoes, very classy! The way that skirt is draped is so elegant! What a perfect outfit! I have been eyeing that skirt for a while but I think these photos just convinced me to buy it! a maxi pleated skirt – a MUST have for spring!! i need one asap. you look lovely! what a romantic, sweet, vintage and chic outfit! really faboulous, love the details photos. I love how the sun shoes your silhouette. Such a great skirt! Love this vintage inspired pleated maxi…and the color is stunning! the colors of this outfit are so chic and that skirt is wonderfful! Great pics congrats! Beautiful pics, colours, outfit… Love it! the bag is to die for!!! Gorgeous outfit! ♥ You look stunning. Love the outfit, it is really cool! That bag is amazing – you look really glam! Where oh where did you find your watch?? I have been hunting for a black dial gold MK watch for AGES! Yours is exactly what I have been searching for! So gorgeous! that skirt is amazing! love the lighting in these photos. you are so adorable when you smile! Wow, that is so HOT! So dreamy! Such a beautiful color palette! These photos are nice as well. By the way where did you shoot them? Oh my… You look so fabulous! I’m in love with Your site!!! I’m Your great fan, all time ever and after:P Now I can finnaly follow You, caouse I’ve made google profile. I’ll also die for this bag!!! love this outfit. i also have a pleated skirt but in orange. I absolutely love this outfit! Love the shoes. I love everything about this outfit.. from the shoes to the bag (especially THAT BAG!) to everything in between. Stunning outfit and lovely colours!! I found your pages today through Marie Claire 2011 June-issue (Flemish/Belgian edition). These copper colours look great in the sunlight, and I’m love love loving floaty maxi skirts right now! The heels are so fabulous.The entire combination looks stylish….!!! amazing! Love the ’70s vibe!